You’re interested in rowing. Great choice! We offer multiple Learn to Row (LTR) classes throughout the year for beginners or people looking for a rowing “refresher” course. We hope that you’ll join a class and try the sport. Our LTR classes are designed for beginners who have no prior rowing knowledge or training. Experienced rowing instructors help you through the mental and physical training you need to be proficient on the water. Learn to Row classes meet once per week, starting with the basics or rowing and gradually introducing new techniques, skills, and verbal commands. By the end of the class, each person will feel comfortable in a boat and will have gained the muscle memory and knowledge to continue with the sport, all while having fun along the way! Our 2019 Learn to Row classes will start the week of May 14. If you wish to be added to the waitlist for a sold out class, please fill out our Contact Form and select the “waitlist” option. You won’t start in a boat. We’ll actually start by rowing on ergometers (rowing machines) to understand the fundamentals of the rowing stroke. Don’t worry, you’ll be in a boat soon enough. It will probably feel awkward. The body movements used in the rowing stroke don’t come naturally, so like any new coordinated motion, you’ll have to build up your muscle memory. The quickest method for learning is to stretch well and listen to the instructors! Port – starboard – waynuff – cox’n – gunnel. Yes, those are all terms that you will hear while learning to row, plus several more! Rowing uses unique terminology to describe parts of the boat and commands while on the water. You’ll probably sweat, but this is not an exercise class. The goal of the class is to teach you to row, not burn calories, so we won’t push everyone to their physical limits. However, rowing will work various parts of your body so it’s a good thing to feel your muscles working! Don’t worry if it’s not as easy as you thought. The LTR programs are 8 weeks for a good reason – it takes time and practice to learn rowing! Please don’t give up, even if you’re frustrated after the first week or two. The only way to improve your rowing technique is through practice. By the end of the class you’ll be rowing with confidence! 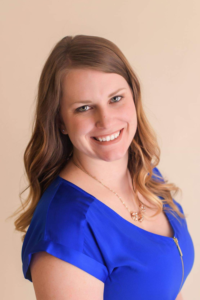 Amber has been involved in rowing since her college days at the University of Michigan. Since then, she has been around the country (and world!) coaching and working with various clubs and programs including Boston College, Berkeley High School, Marin Rowing Club and North Bay Rowing Club. She has also competed and medalled in the women’s U.S. Nationals event and narrowly missed out competing at the 2000 Summer Olympics in Sydney, Australia. Amber is passionate about teaching people to row and excel in the sport, and is excited to be coaching at Bay City Rowing Club! Alicia joined the Bay City Rowing Club in 2016. After quickly learning and finding a passion for rowing, she has been committed to working alongside coaches and getting involved in Learn to Row programs. Alicia has a natural aptitude for team leadership and enjoys working the cox position of commanding and steering rowing shells. She enjoys participating in regattas and is great at keeping the positive energy high for the entire team! When not rowing, Alicia can also be found volunteering for the Big Brother Big Sister organization and working as a cosmetologist. 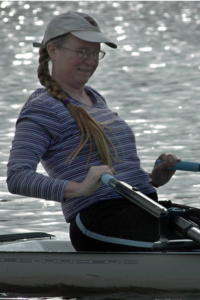 Lora is a Level 1 Certified US Rowing Coach and has been a member of BCRC for 19 years. She fell in love with rowing after taking a sculling class taught at BCRC in 2000, and has been an active member ever since as a recreational, competitive rower and cox. Lora is enthusiastic about sharing her love of rowing with others, and is looking forward to coaching new rowers through the Learn to Row program! See you at the boathouse! 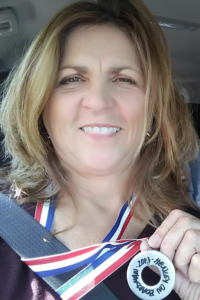 Carol is a Speech Therapist from Frankenmuth that joined the Bay City Rowing Club in 2015 and has been enthusiastically studying rowing ever since!! 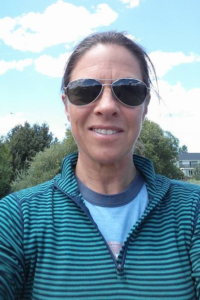 She has been a passionate, helpful assistant instructor with BCRC Learn to Row classes for the past few years and attended the first ever Scholastic coaching forum in Michigan in 2018. She can’t wait to help others discover their love of rowing. Go crew!! Comfortable exercise clothes, socks and a water bottle are a must. If the weather is nice, we also recommend a hat, sunglasses and sunscreen. If the weather is windy or colder, it helps to have an extra layer of clothing like a wind-breaker or light long-sleeve jacket. Optional items would include a change of clothes (sometimes you can get splashed with water) and extra shoes or flip-flops to keep in the boat while rowing. Electronics should be left in your car or in our secure locker rooms. Do I need to be a member to sign up for a LTR class? No, we do not require membership to take a LTR class. However, if at any point during the class or after the class you wish to utilize other BCRC programs, membership would be required (for instance, if you want to start rowing outside of the class during our group rowing sessions). Once the class is completed you’ll be a proficient rower, so of course we’d love for you to continue your involvement by joining! Do I need to be in good physical shape to join? With rowing, there is no perfect place to start. Whether you consider yourself physically fit or not, we encourage you to try a LTR class to learn the sport and see how you like it. Rowing will challenge you both mentally and physically, but you can scale your own physical effort according to your own limits. Be aware though – rowing is rewarding and can be highly addictive. When do I need to register by? Our boats are filled on a first-come-first-served basis, so if you know you want to participate in a LTR class, we recommend signing up without too much delay. If a class is already filled, we will keep a wait list in case a boat seat opens up. If we have enough interest, we may add additional boats to the class to accommodate everyone that wants to learn. Where do the classes take place? All LTR classes are held at our boathouse on Middle Ground island in Bay City (a map is available on our Contact page). LTR classes involve both indoor and outdoor training. We row on the Saginaw River, and we might travel a few miles north or south on the river while rowing. Any on-land or indoor practice will happen in, or close by, our boathouse. There is a parking lot directly in front of the boathouse. In the event the parking lot is full, feel free to park at the Boys and Girls Club across the street. Is there a safe place to keep my stuff when we are on the river? Our boathouse has both a men’s and women’s locker room, and both have individual lockers that are available for temporary use at no charge. However, our boathouse is always locked while we are on the water, so many of our members leave their belonging on the seats in the locker rooms without any worry. If you’d like the use of a locker, make sure you ask when coming to your first class. You can also bring your own lock to use. What if I have to miss a class? We understand you may have to miss one or two classes, and that’s fine. It will be your responsibility to let your LTR instructor know as early as possible and help fill the boat seat. We don’t recommend missing more that 1-2 classes, as this could start to set you back with learning. Will a class be cancelled if the weather is bad? Canceling a class is highly unlikely. We have the ability to practice both indoors and outdoors, so even if weather doesn’t allow for rowing on the river, your class will likely still practice indoors at the boathouse on rowing machines. If a class must be canceled, your LTR instructor will send an email (or call) as early as possible to let everyone know. Any student under the age of 16 must pass a swim test before participating. Adults should also be able to swim, but will only need to provide verbal confirmation. All of our boats are equipped with floatation devices for rowers in the event of a capsize or a rower exiting the boat. Submit a question about our Learn to Row program through the email form on the Contact page.